It’s safer to heat food in a microwave oven on a stoneware TV Dinner Tray than in plastic. They’re a great solution for people that don’t like their foods to touch each other like they will on a regular dinner plate. With a TV Dinner Tray you can make food ahead of time, either days or weeks ahead and freeze for eating at a later date. Or to keep on hand for when you’re in a pinch for what to make for dinner that night! The TV Dinner Tray can be purchased singly, or in a set of four. 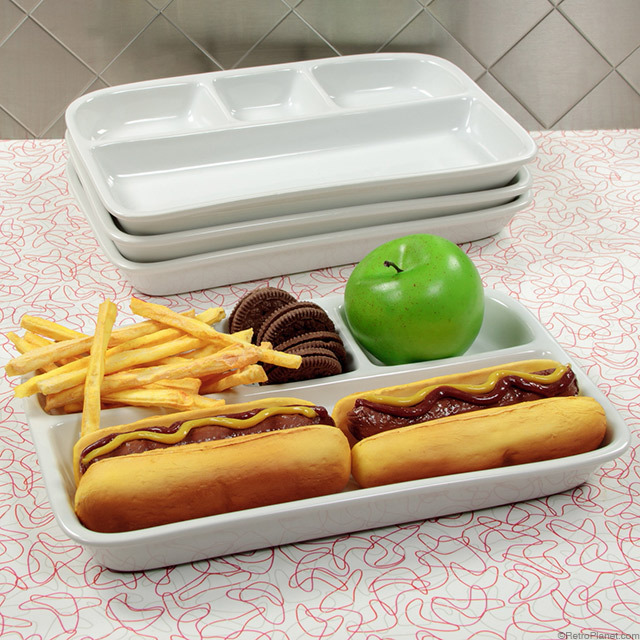 Our hugely popular Stoneware TV Dinner Trays are loved by many for their practicality, durability and ease of cleaning. So we thought we’d introduce a few ideas of our own for repurposing the white stoneware TV Dinner Tray. As you’ll see—they’re not just for the kitchen! 1. Position a TV Dinner Tray near your front door to hold mail, keys, loose change, sunglasses, cell phones and other do-dads. It’s also a great place to put that one thing that you may need to take that day but don’t want to forget! 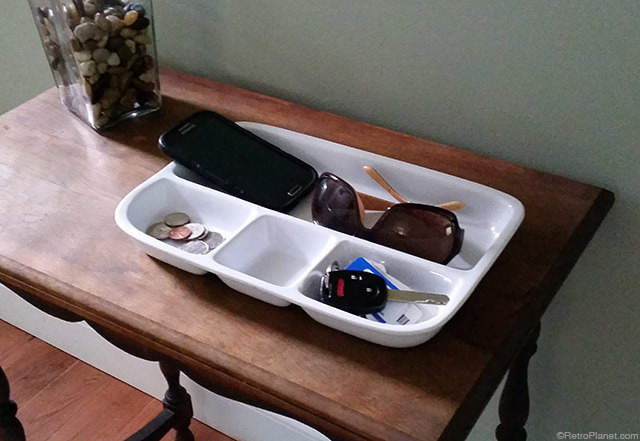 Having a “catch-all” tray near the door is a great reminder not to forget important things like the phone, car keys and sunglasses. It’s a great place to drop these same things when you come back in. 2. Place in a powder room or bath to hold soap, combs, brushes, hair ties, swabs, cotton makeup squares, and other items you’d like to have at the ready. The beautiful white stoneware coordinates with any bath and washes easily for quick cleanup. 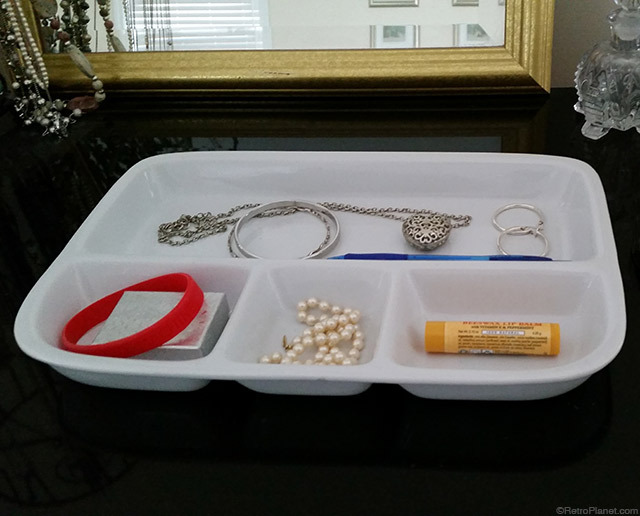 Keeping all the necessities where you need them in a bathroom saves time when you get ready in the morning. 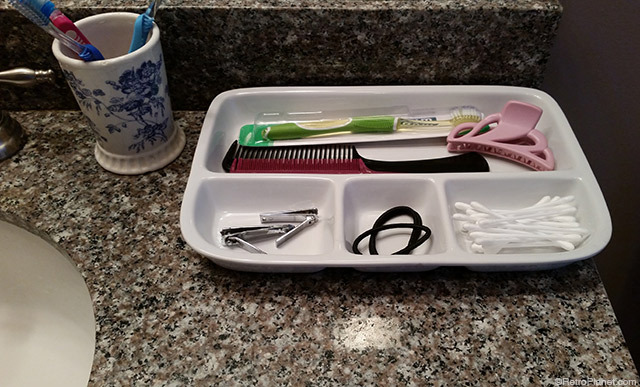 You won’t need to dig through drawers when these items are placed in this divided tray. 3. Add one or more to your bureau as a caddy to hold your watch, rings, necklaces, wallet, etc. Turn chaos into order when you place a divided tray on your bureau top. It’s perfect for holding jewelry and all the other small items that tend to get misplaced. 4. Fantastic on a work table in a craft room for assorted items, such as scissors, buttons, measuring tape, pins, etc. Can use multiple dishes for a wide variety of necessities. 5. Use for serving foods at gatherings, like fruit, olives, cheese, crackers, etc. The compartments make the TV Dinner Tray a perfect way to serve dips and a variety of flavored olive oils with chunks of Italian bread. These ideas are just a few how-to suggestions to get you started on your way. We’re sure you’ll be able to come up with plenty of other uses on your own!